Derma 2019 welcomes all the attendees, lecturers, patrons and other research expertise from all over the world to 25th International Conference on Dermatology & Skin Care which is going to be held on November 5th-6th 2019 in Vienna, Austria. 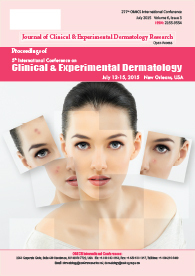 We are thrilled to invite you all to discuss and share your views and involvement on the Impelled Concepts and Frameworks for Dermatology and Skin Care. Derma 2019 offers a dais to take attention to explore, grip and meet with prominent speakers of the field, including both broad and specific subjects. Derma 2019 will be surrounded around the theme “Good Skin Good Life”. We aim to unify all the people indulged in this vast field and share the knowledge, explore and look forward to the new way by integrating new thoughts and customizing the limits of future technology. Conference Series LLC Ltd unifies 1000+ Global Events Every Year across USA, Europe & Asia with support from 1000 more scientific societies and Publishes 700+ Open access journals which contain over 1,00,000 well-known personalities, reputed researchers at editorial board and organizing committee followers. Through, members around the world focused on learning about Dermatology and its developments; this will be the best opportunity to reach the largest assemblage of participants from the Dermatology community. Comportment presentations, distribute information, meeting current and potential scientists, make a splash with new drug developments, and receive name recognition at this two days event in Austria. 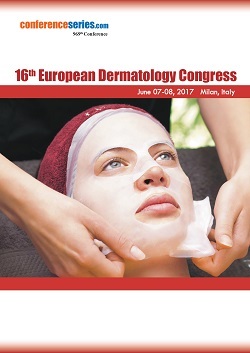 World-renowned speakers, the most recent performances, expansions, and the new updates in Dermatology are assurances of this conference. Despite how skilled you are at work, everybody can learn. Working in an independent venture can constantly be disengaging, and without exposure to an assortment of perspectives, we can miss new thoughts and patterns that can affect future outcomes. The informative part of a meeting can open you to better strategies for directing your business and enable you to find how to be more gainful. Skin disease is not a leading cause of fatality it is not commonly thought of as a major health issue in developing countries. But still, it is remarkably common; up to 21-87% of the population may be affected by some type of skin problem, depending on the locale. It also provides to significant physical and psychological disabilities. These disabilities have been measured by a number of life quality standards but the importance of skin health is often underrated because of the chronic, non-life threatening nature of most skin diseases. Disfigurement and discomfort associated with skin problems make them among the main reasons people seek medical care and are the cause of approximately 24% of primary care visits. Derma 2019 conference provides a great opportunity for doctors, students and industry professionals to network and gain immense knowledge. Collaboration is the way to approach networking. When you are engaged with different individuals around the world, you position yourself as an expert. 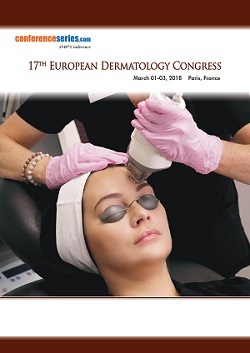 Widely acclaimed speakers, the most recent techniques, methodologies, and the most state-of-the-art updates in dermatology are indications of this meeting. Vienna is the capital and largest city, situated in the North-East of Austria and lies on the banks of the majestic Danube River. Vienna is also said to be "The City of Dreams", Surrounded by the natural beauty of the Wachau region, Vienna woods and numerous green expanses and with various superb parks. The city is known for its most famous palaces like Schönbrunn, Spanish Riding School, and the Habsburgs’ summer residence. It is having more than 100 art museums, which collectively attract over eight million visitors per year. Vienna is ranked as one of the wealthiest regions in the European Union. According to Quality of Life Survey Vienna was ranked second on a list of the top 25 cities in the world. Between 2005 and 2017, Vienna was the world's number-one destination for international congresses and conventions by attracting over 6.8 million tourists a year. Vienna is Austria's principal Centre of education and home to numerous universities, professional colleges and gymnasiums. Skin tumours are diseases that appear from the skin. They happen due to the improvement of uncharacteristic cells that can attack or spread to different parts of the body. Side by side Basal-cell malignancy develops progressively and can harm the tissue around it yet is probably not going to spread too far off territories. Plastic surgery is defined as a surgical department committed to the modernization of facial and body defects due to birth disorders, trauma, burns, and disease. Plastic surgery is projected to correct dysfunctional areas of the body and is reconstructive in nature. Skin disorders vary greatly in symptoms and harshness. They can be provisional or permanent and may be painless or painful. Some have situational causes, while others may be hereditary. Some skin conditions are minor whereas others can be life-threatening. While most skin disorders are minor, others can indicate a more serious matter. Skin cancer appears due to the abnormal growth of skin cells often develops on skin exposed to the sun. But this common form of cancer can also occur on areas of your skin not ordinarily unprotected to sunlight. You can reduce your risk of skin cancer by limiting or avoiding introduction to ultraviolet (UV) radiation. Early discovery of skin cancer gives a chance. The list of injectable skin fillers available for soft tissue increase is uniformly growing, giving aesthetic surgeons more options in the treatment of lines, scars and wrinkles. Each type of filler is different with regard to envisioned use, technique, duration in tissue, ease of usage. Skin grafting is a type of graft surgery involving the relocation of skin. The transplanted tissue is called a skin graft. Skin grafting is often used to treat Extensive wounding or Burns. The grafting serves two purposes to reduce the course of conduct needed and improve the function and appearance of part of the body which collects the skin graft. Laser resurfacing is usually done with a 2940 nm Erbium laser or a 10,600 nm CO2 laser. Dermatologic surgery refers to that sub-speciality of dermatology that manages skin conditions through surgical events. These procedures may involve the insincere layers of the skin or outspread through to the original layers of muscle or fat below depending on the condition being treated. All of our physicians routinely perform dermatologic surgery. Several of our physicians have received progressive training in unambiguous areas of dermatologic surgery such as Mohs surgery and laser surgery. Skin biopsy is a biopsy method in which a skin wound is removed to be sent to a pathologist to reduce a microscopic diagnosis. It is usually done under local anaesthetic in a physician's office and results are often available in 4 to 10 days. It is normally performed by dermatologists. Portrait skin regeneration is not like other treatment offered these days. It’s the primary technology tested to deliver true skin regeneration. Whereas some of the treatments result in improved skin solely at the surface, clinically tested Portrait alters structures below the surface, making distinctive conditions for continued regeneration and enhancements in wrinkles, tone, texture and discolouration. Throughout the short procedure, the distinctive scientific action of Portrait transfers the plasma energy to the treated space without making direct contact with the skin. This system preserves the skin’s outer layers that act as a protecting dressing till new skin regenerates. Dermatological conditions are a standout amongst the most popularly known sorts of clutters around the world, and roughly 33% of the US populace experiences no less than one dynamic skin condition. For the past decades, most of the dermatology advertises has stayed immersed with set up items. Be that as it may, the clinical and business achievement of biologics in the treatment of skin disease, and in addition progressions in the comprehension of the illness pathways of various dermatological conditions, have prompted to a re-established enthusiasm from pharmaceutical organizations in the dermatology showcase, and along these lines the rise of a creative pipeline. This report covers every dermatological issue; however there is a specific concentrate on three key sicknesses: atopic dermatitis, skin break out vulgaris and psoriasis, as these conditions have the most noteworthy commonness and the biggest pipeline. The worldwide dermatology market was esteemed at $20.0 billion in 2015, mirroring a five-year CAGR of 2.6%. 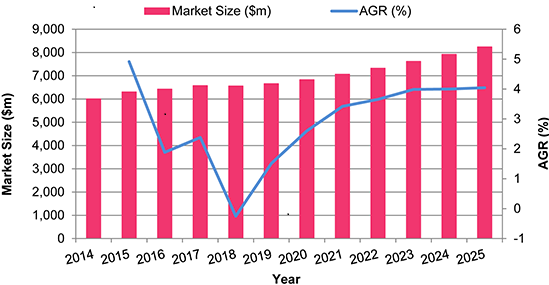 BRIC (Brazil, Russia, India, China), the quickest developing district of the worldwide dermatology advertise with a five-year CAGR of 6%, ought to aggregate more than $4.6 billion by 2020 and is anticipated to develop at an extensive Compound Annual Growth Rate (CAGR) of 7.73%, achieving $33.7 billion in 2022. Key drivers of this growth will be the take-up of as of late affirmed premium biologics, and additionally encouraging late-arrange items that are relied upon to be very significant. 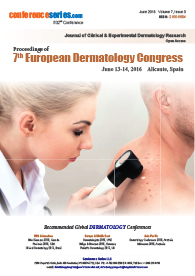 Organizations are again entering the dermatology part by expanding the signs of existing items into dermatology. This report primarily examines professionally prescribed medications utilized as a part of the treatment of skin ailments. Skin conditions are among the most widely recognized medical issues among most national populaces, altogether surpassing the predominance of conditions, for example, weight, hypertension and growth. The significant expenses of skin sicknesses incorporate doctor visits, healing facility mind, physician-endorsed drugs and over-the-counter items for treating or dealing with these conditions, and also backhanded expenses because of efficiency misfortunes. Most huge Pharmaceutical organizations joined the dermatology advertise with topical steroids in view of particles initially produced for other remedial territories. The low costs for built-up items and the lack of new creative solution items in dermatology neglected to provide them with the development they looked for. Moreover, the development of cosmeceuticals and the enlistment of dermatology items as restorative gadgets meant to expand in the OTC segment. Conference Series LLC LTD hosted the 20th World Dermatology Congress which was held during March 13-14, 2019 Singapore and was a great success, where renowned keynote speakers from several reputed institutions and organizations with their glorious presence addressed the gathering. Generous response and active participation were received from Renowned Experts and Editorial Board Members of Supporting International Journals as well as from the Dermatologist, Cosmetologist, Plastic Surgeons, Professors, Scientists, Researchers, Students and Leaders from the fields of Dermatology and Skin Care, who made this event successful. The meeting was carried out through various informative and cutting edge sessions, in which the discussions were held on thought-provoking and celebrating scientific tracks. Conference Series LLC LTD offers its sincere thanks to Societies and Organizations, is also obliged to the Organizing Committee Members, adepts of the field, numerous outside experts, company representatives and other prominent personalities who encouraged and led the event to the path of success. With the valuable feedback and generous response obtained from the participants of the event, Conference Series LLC LTD would like to declare the of the “25th International Conference on Dermatology and Skin Care” during November 05-06, 2019 at Vienna, Austria.